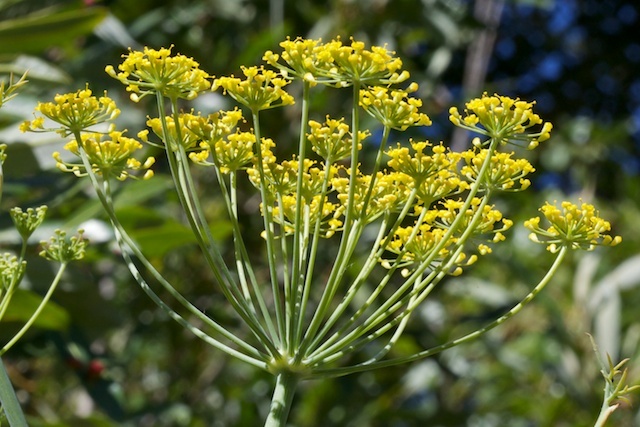 Highly toxic; the same plant that was used by the ancient Greeks to kill Socrates. 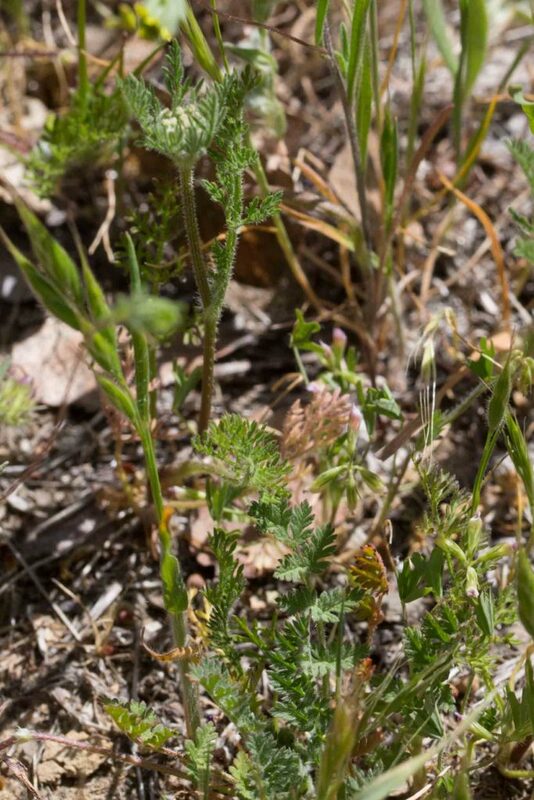 The leaves are generally 2-pinnate and highly cut leaves. 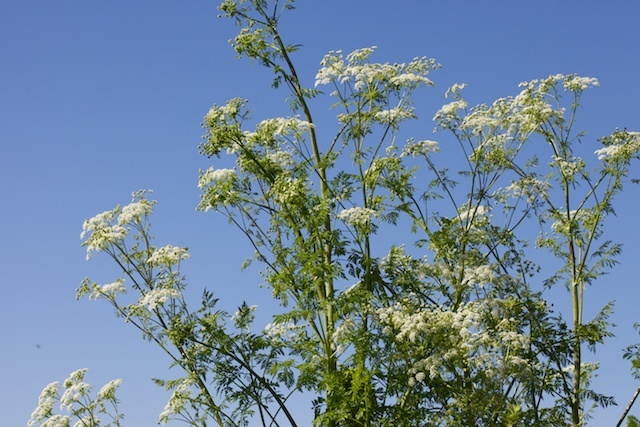 Eating even a few of the leaves can be fatal. 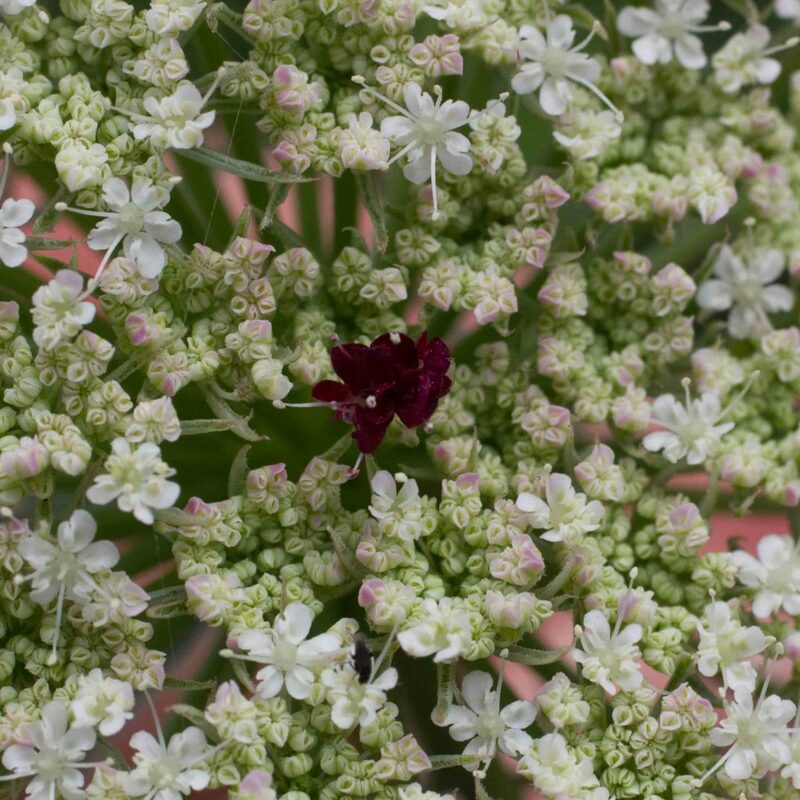 Mature plants usually have red speckles on their stems (known as “Socrates’ blood”) — a distinctive feature which allows this plant to be distinguished from some of the other members of its family. 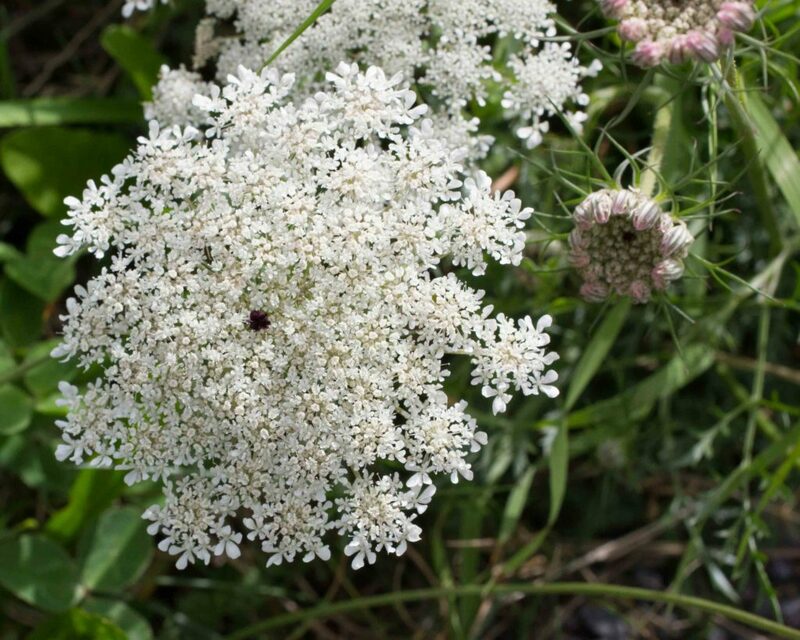 If in doubt, do not eat it. 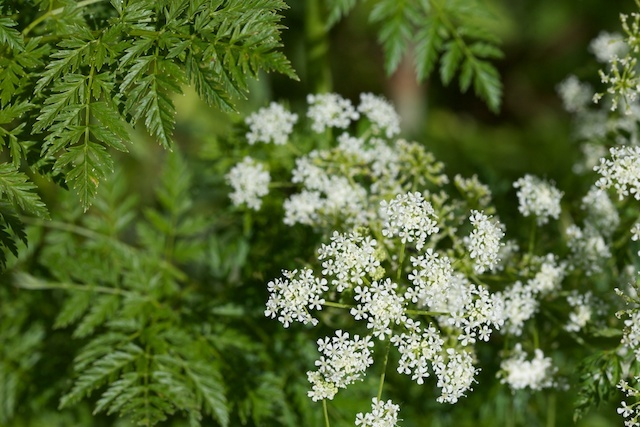 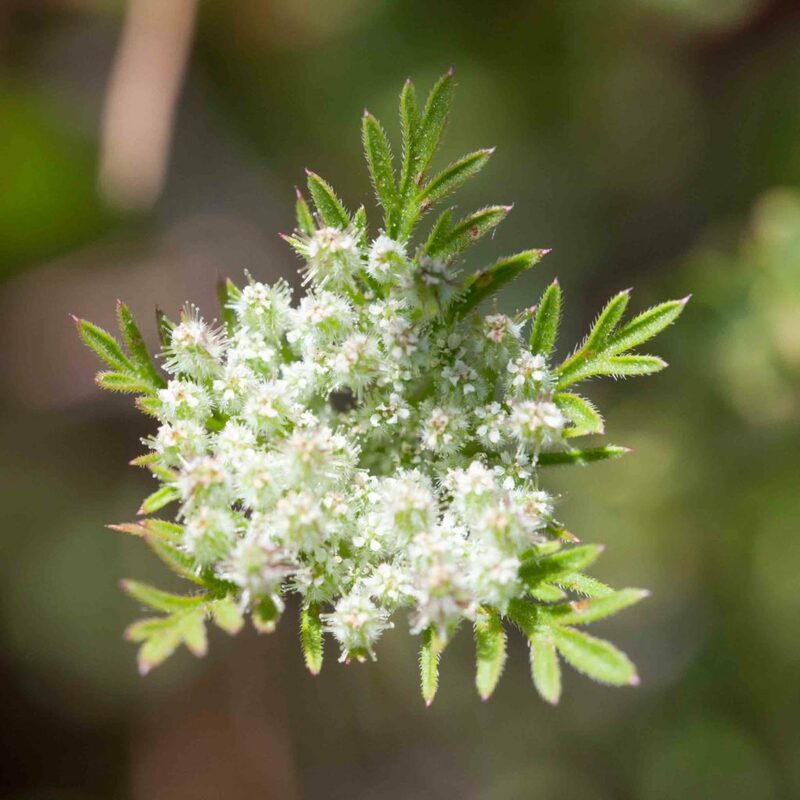 The general appearance is not unlike Poison Hemlock but the pure white inflorescence is frequently hemispheric and/or has a small dark red, almost black, dot in the center (according to legend, representing the blood drawn when the English Queen Anne (1703–20) pricked her finger while making lace. 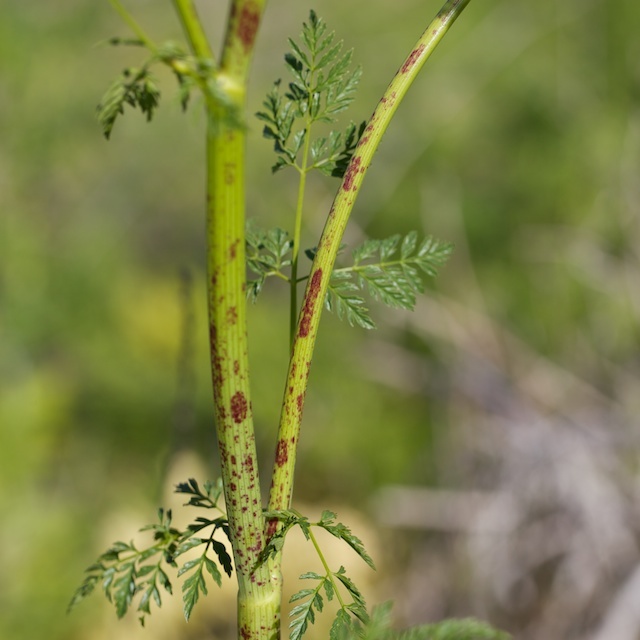 The stems lack the red blotches characteristic of Poison Hemlock. 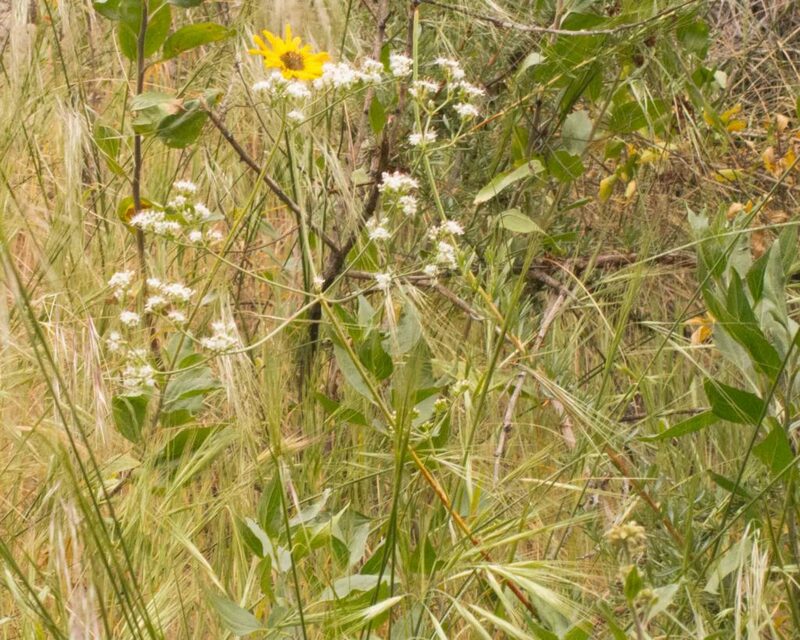 The flowers are subtended by conspicuous bracts divided into long, linear to thread-like segments. 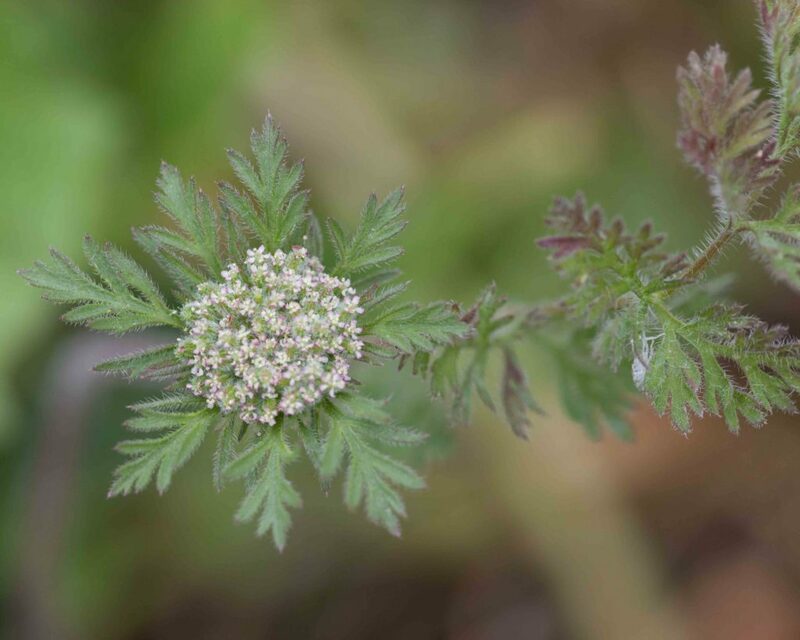 A close relative of Queen Anne’s Lace (Daucus carota) despite a very different appearance. 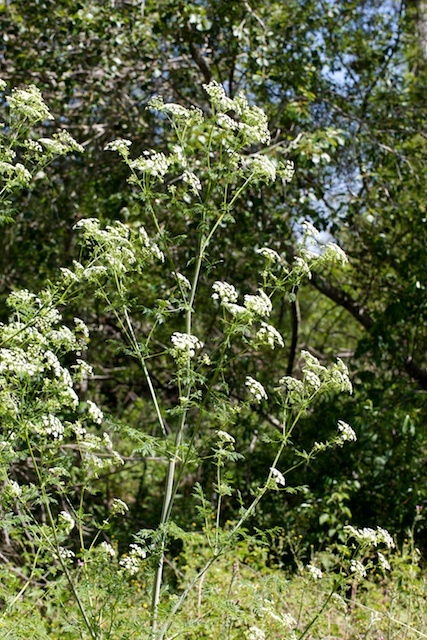 Usually a small plant with its dense inflorescence of white to pink-tinged flowers immediately subtended by conspicuous, leaf-like bracts. 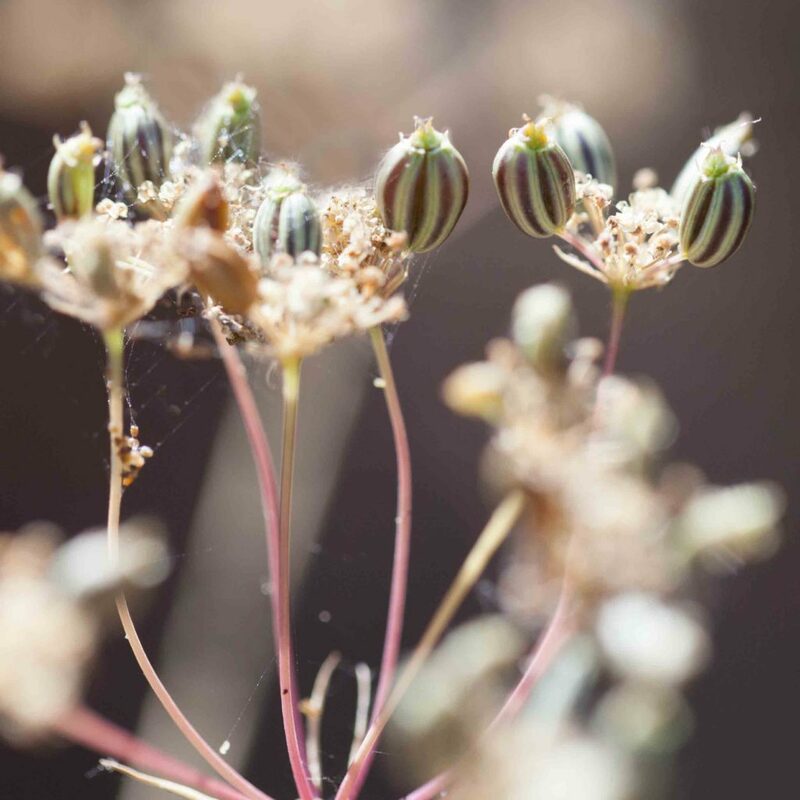 Bristly stems. 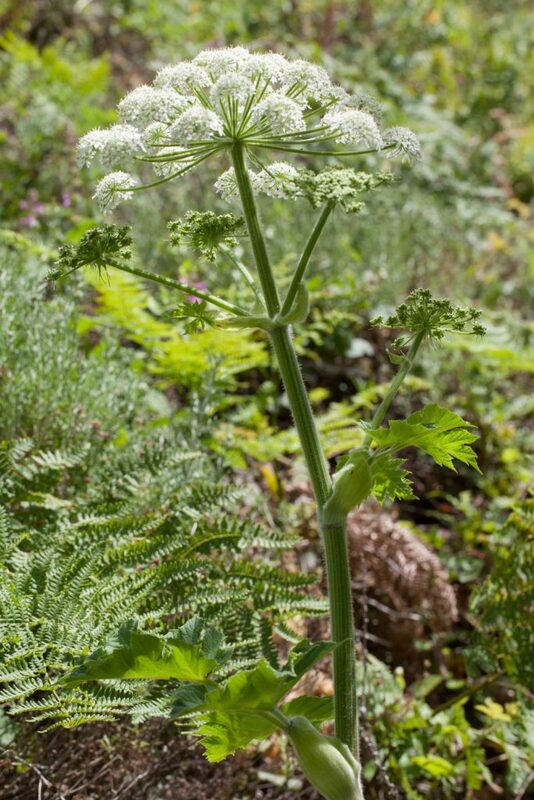 A large plant, distinguished by its very large, coarsely lobed leaves (as much as 50 cm wide) and the wide sheaths at the base of each petiole. 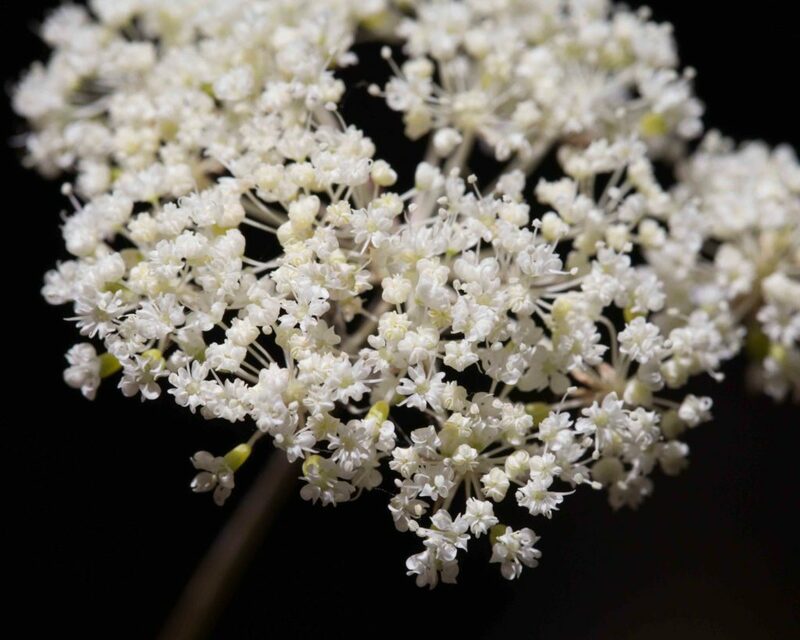 The inflorescence is an umbel of dull, white flowers, each with 5 notched petals. 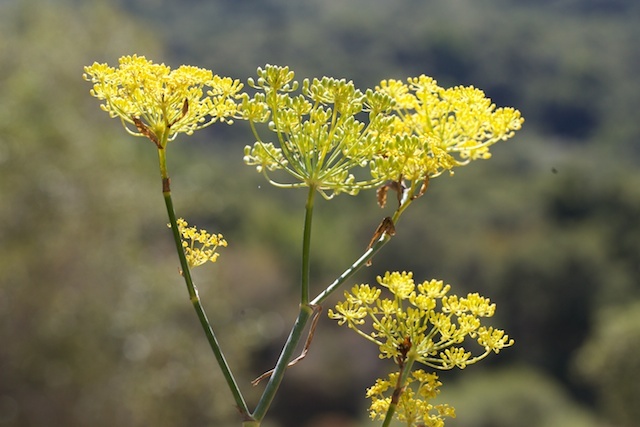 Immediately recognizable by its compound umbels of bright yellow flowers and its delicate, finely pinnate, thread-like leaves. 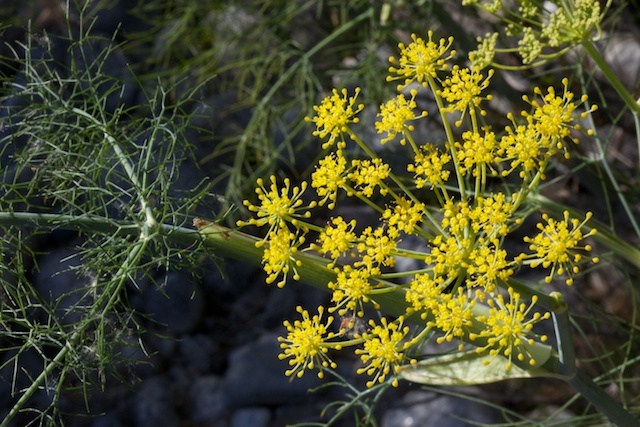 Both leaves and seeds have an unmistakable anise taste. 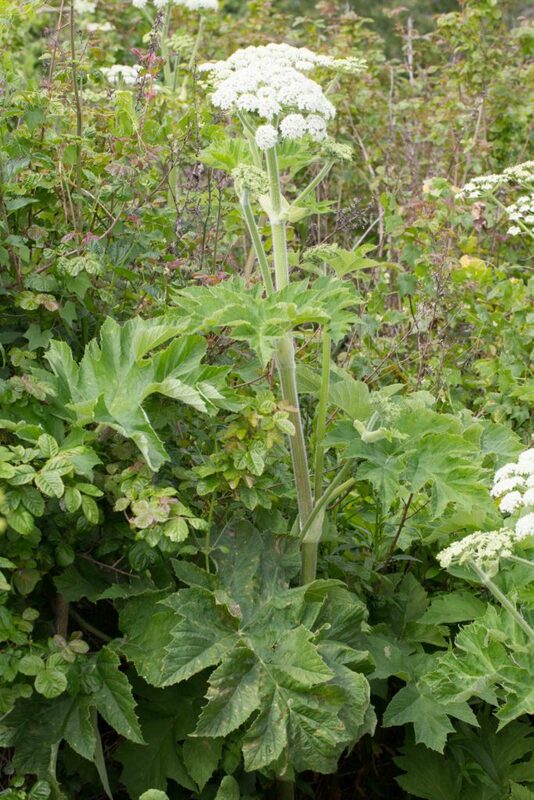 Slender, erect stem. 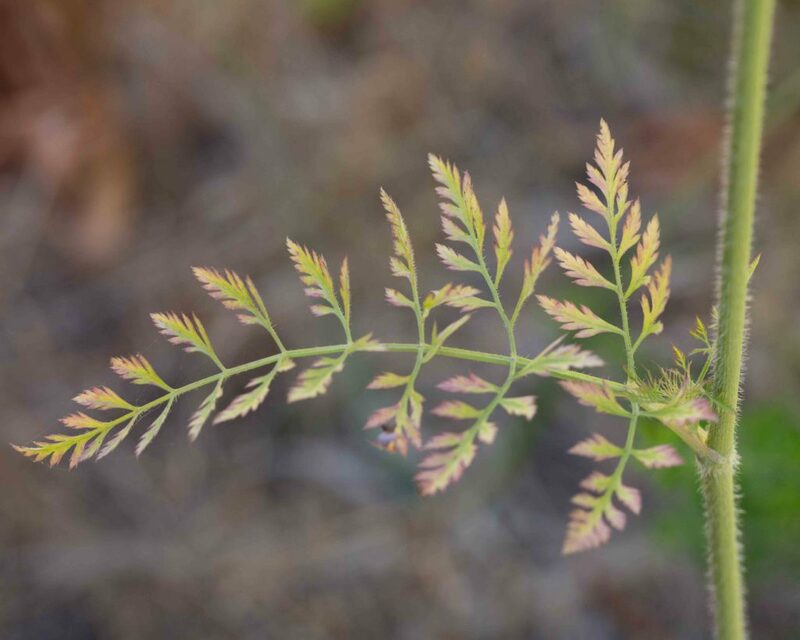 Leaves near the base of the plant have blades up to 35 cm long, divided into many narrow, subdivided lobes. 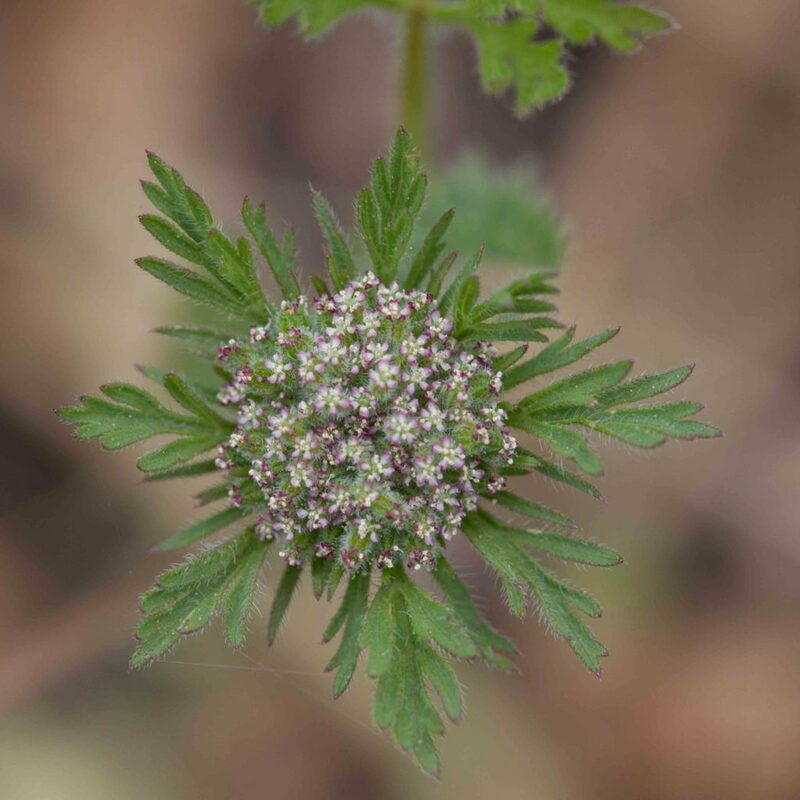 Upper leaves are smaller and less divided. 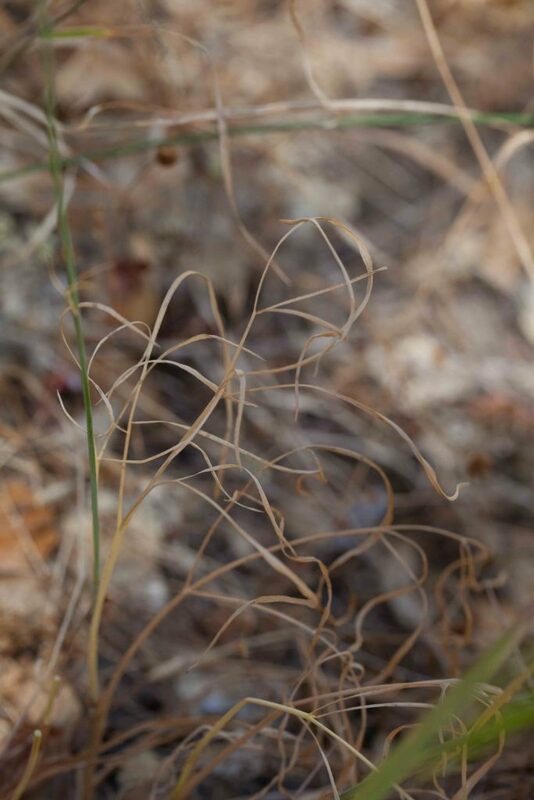 Leaves are usually withered by flowering time. 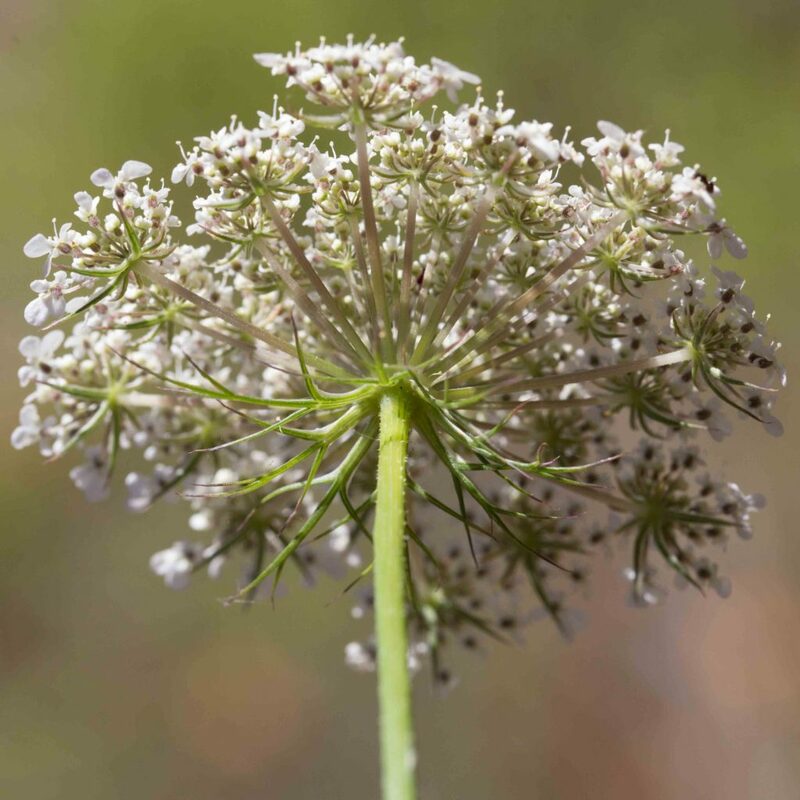 The inflorescence is a compound umbel with 7–14 unequal rays with 0–2 bracts at its base. 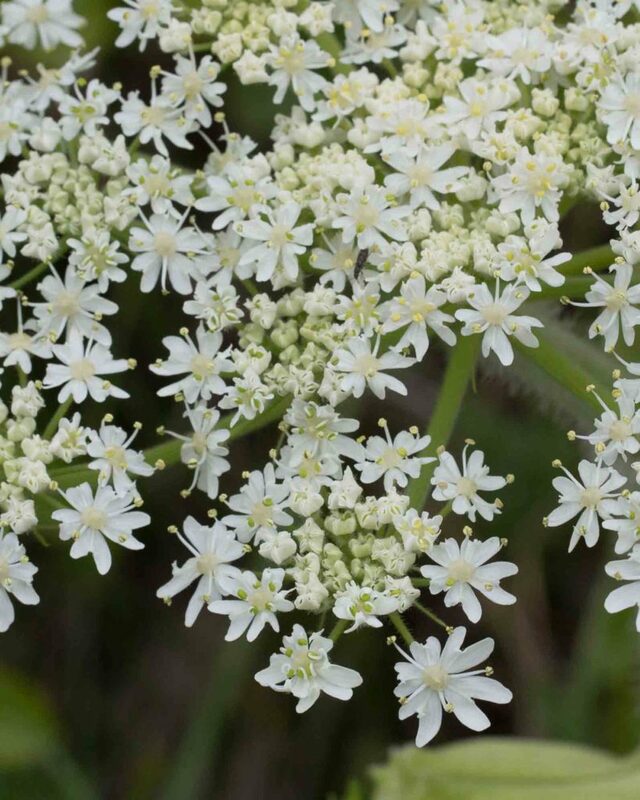 Each of the secondary umbels has 15–40 flowers and 8–13 bractlets. 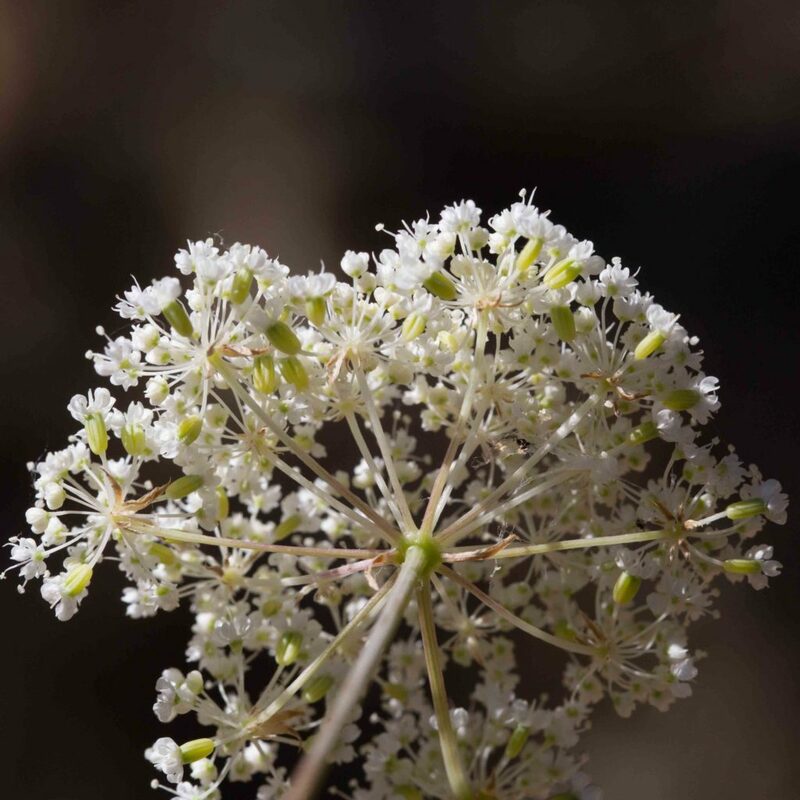 The ovary is inferior ovary with a +/- persistent conical projection subtending two 1–2 mm, slender styles. 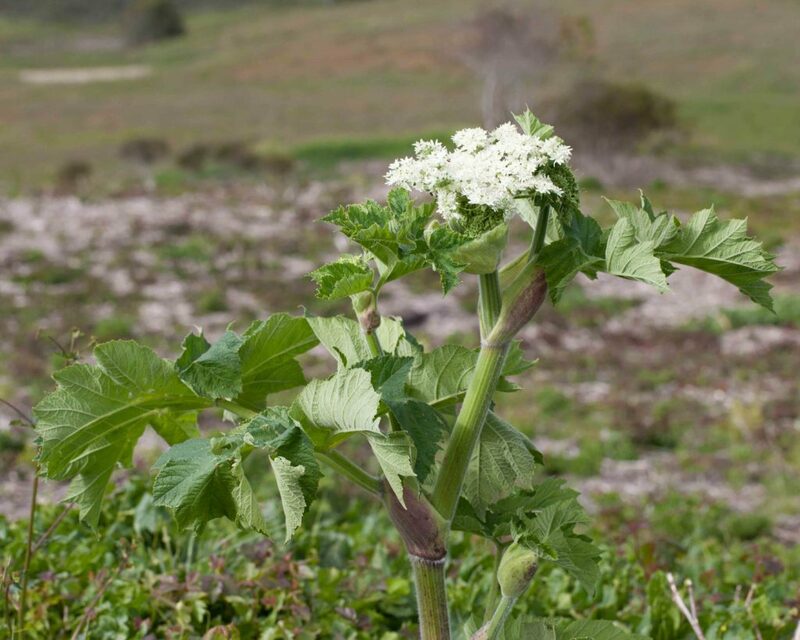 The fruit is roundish, as broad as long. 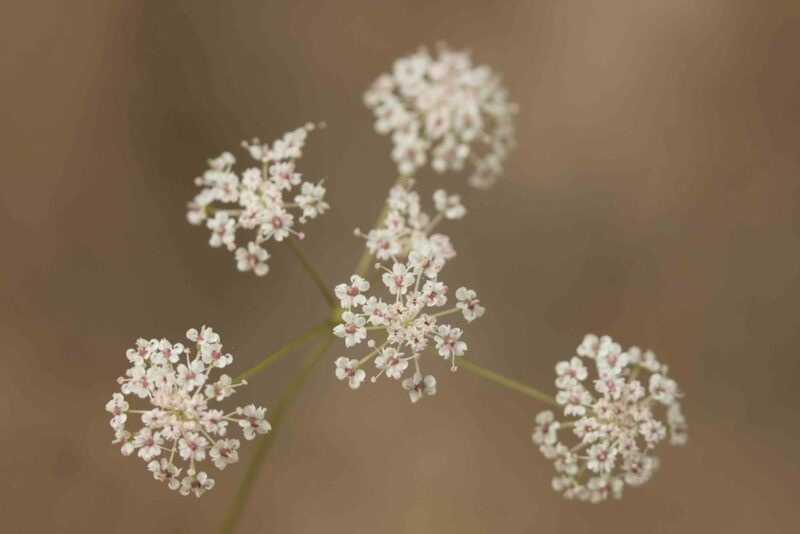 The inflorescence is umbel-shaped and there are 8–10 brown bracts and up to 10 bractlets. 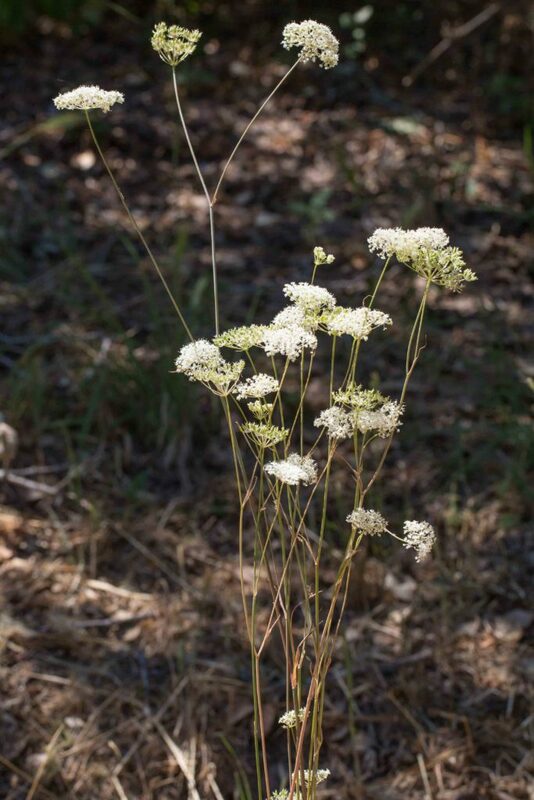 This is a stouter plant than the Gairdner’s Yampah (Perideridia gairdneri), with noticeable fibrous roots and fully sheathed stems to the divided basal leaves. 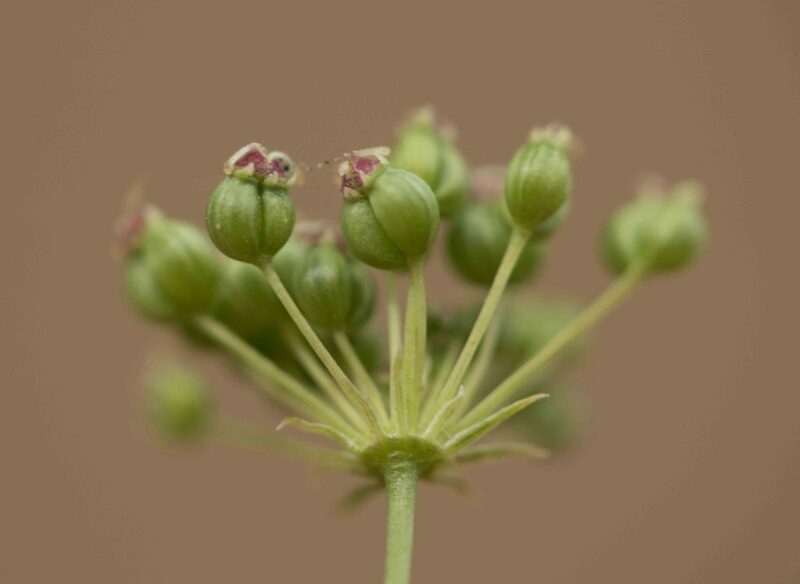 The bracts and elliptic to oblong fruit with short stubby stigmas also help differentiate it from Gairdner’s Yampah. 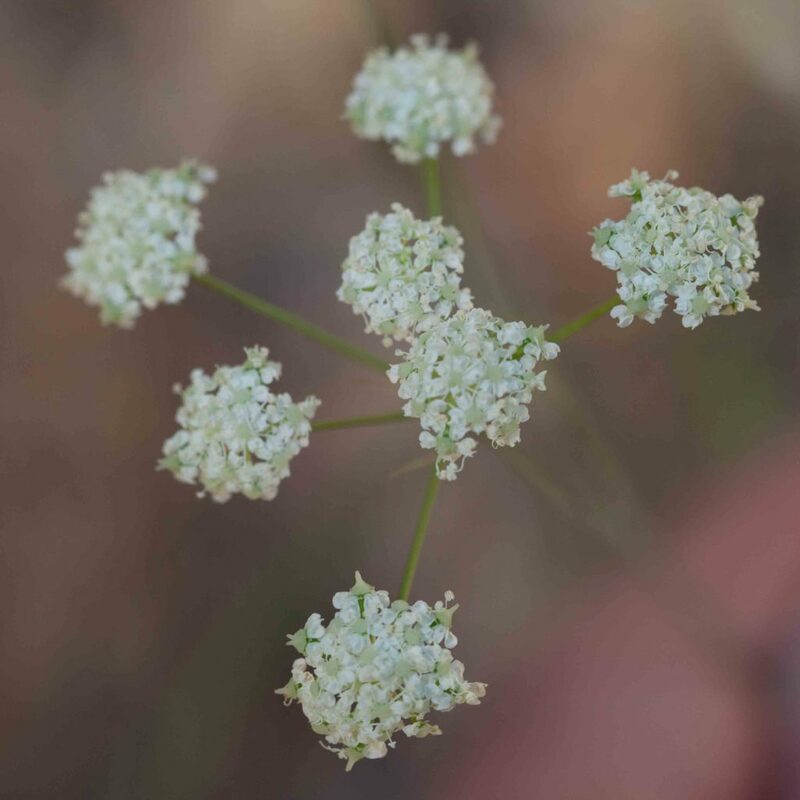 Smaller than Gairdner’s or Kellogg’s Yampah (Perideridia gairdneri or kelloggii) and distinguished by its slimmer, oblong fruits and the number of its bracts (generally 6–10 but sometimes as few as 0–2) and fewer bractlets (4–8). 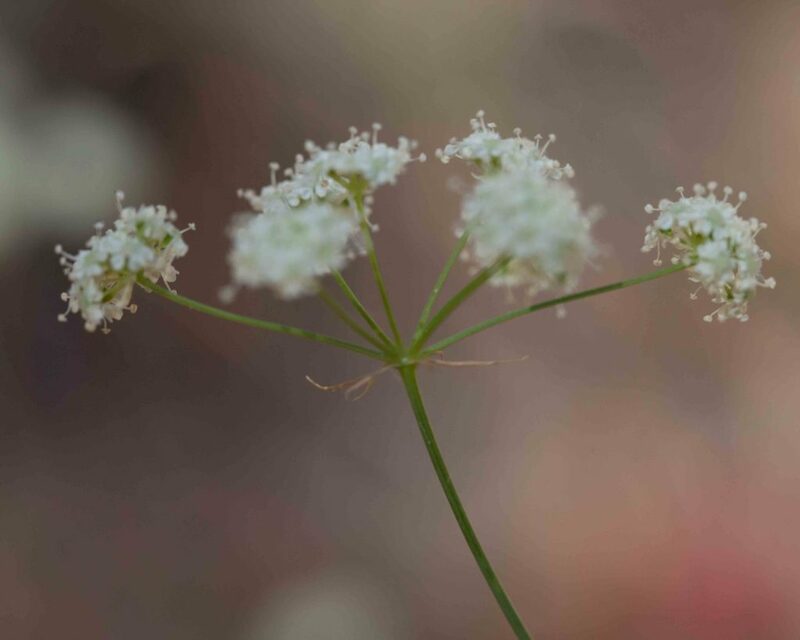 Styles are narrow and reflexed. 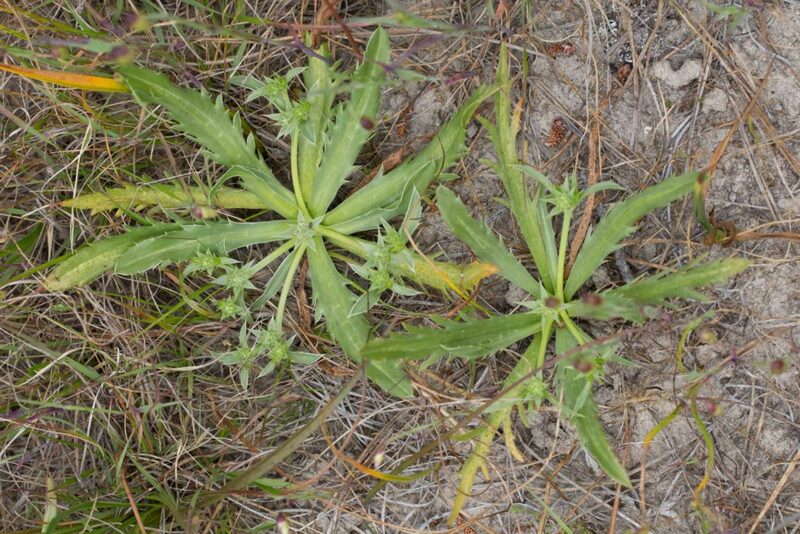 A low-growing, somewhat thistle-like, plant with thick green to yellow-green leaves, each long and straight. 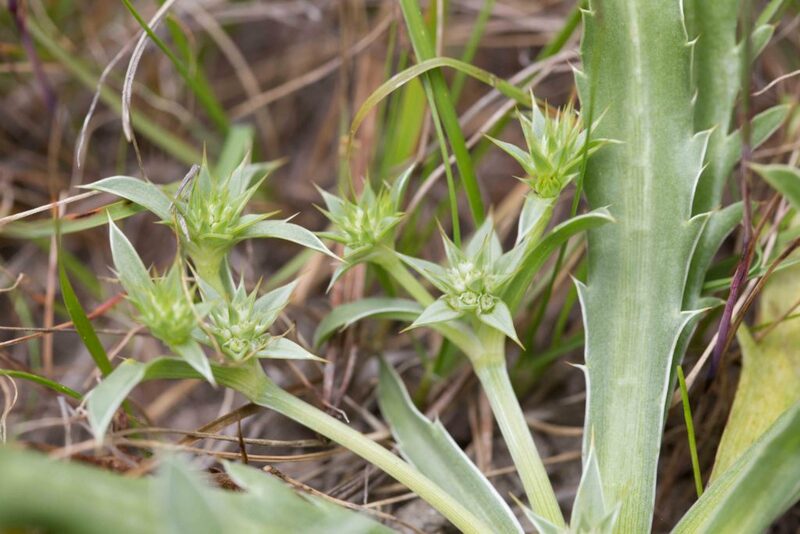 There are stout stems bearing spiky flower heads. 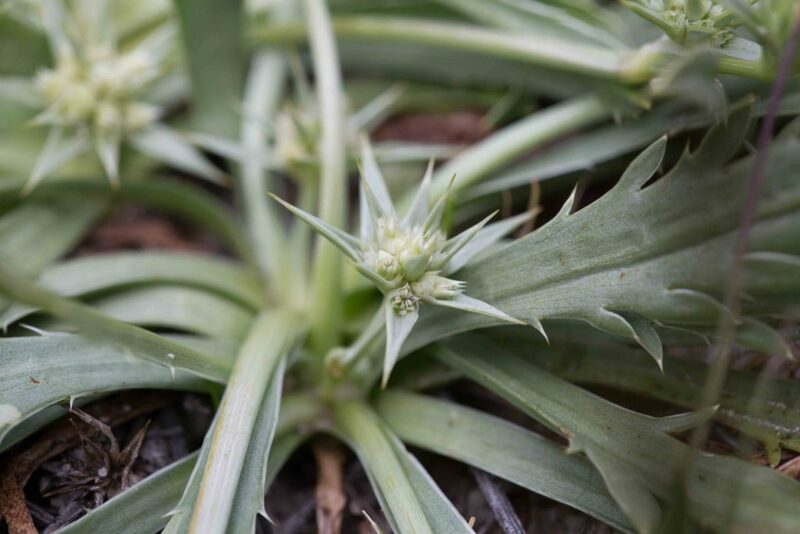 Each is surrounded by 1 or 2 layers of sharp bracts. 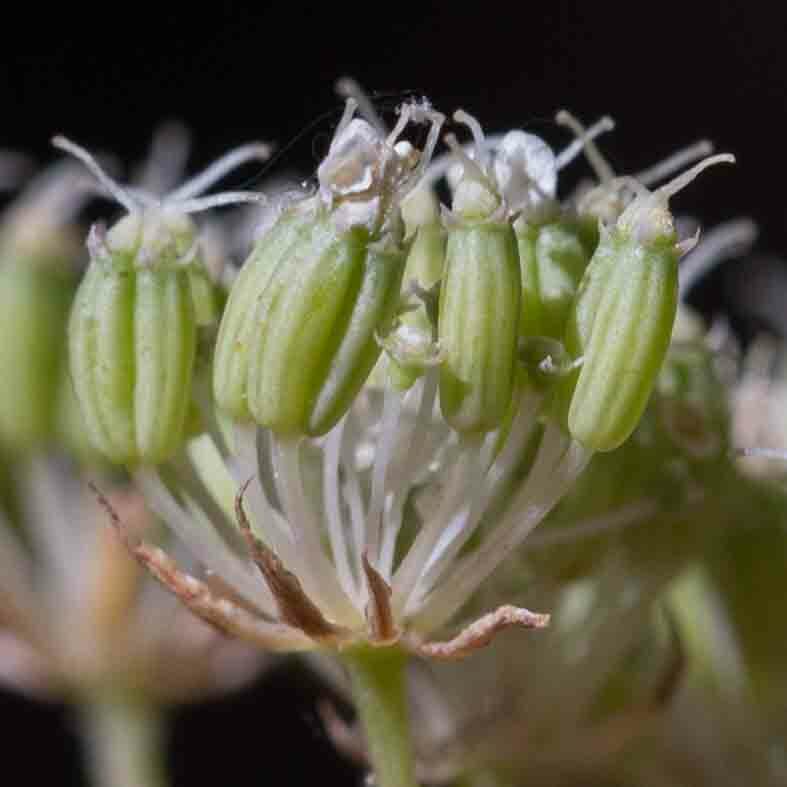 The tiny white to greenish flowers are tucked between the layers of bracts.